Tapa recipes are perfect for a casual dinner party as serving these little bites of heaven are a great way to feed your guests without tying them down to the table. Here are our top three tapa recipes that are easy to make and scrumptious for snacking, and perfect to pair with a good bottle of wine. This is a really fast tapas recipe. The change of season does not mean that you should exclude yummy salads from your diet. 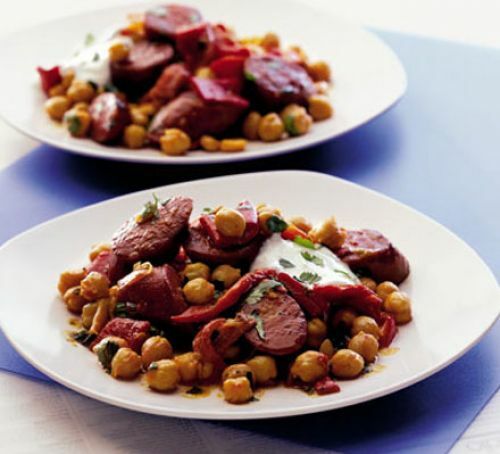 This warm salad has mouth-watering Mediterranean flavours which include warm chickpeas, chorizo and peppers, perfect for a cold night. This warm salad is a no-brainer to make and could serve as a tapa or a small main meal. Cut the chorizo into three-centimetre thick slices. Heat olive oil in a large frying pan over high heat. Add the chorizo and cook for four to five minutes while turning occasionally until it releases red oil. Thereafter, add the chickpeas into the pan and cook together until hot. Then add the peppers and cook for a few minutes. Once the peppers become juicy, remove the pan from the heat and stir in the coriander. Dish the warm salad into serving bowls and top with a spoonful of yogurt. For a quick tapas recipe you’ll want to try making these delicious lamb lollies. This is a fun way to serve lamb or even switch it up with pork, particularly for a dinner party. What’s so enticing about cooking these lamb lollies is that it takes a few minutes to make and the next thing you know its bursting with tantalising flavours that make for tasty tapas platter. Skewer the lamb to create lamb lollies. In a bowl, combine lemon juice and zest, rosemary, garlic and olive oil. Then season with salt and pepper and add the lamb lollies and coat with the mixture until well covered. Allow the lamb lollies to marinate at room temperature while you prepare the next part of your dish. To create your chunky pesto, combine blanched peas, feta, garlic, herbs and lemon in a food processor. Pulse the mixture until it forms a chunky consistency. Slowly, add the olive oil according to preference. Season the mixture with salt and pepper according to taste. Preheat a griddle pan until it’s smoking, then reduce to moderate heat. Grill the lamb for six to eight minutes on each side or until it is has cooked to your liking. Allow the lamb to rest for five minutes before serving. Serve lamb lollies with a side of pea pesto and garnish with some pickled red onion. Enjoy a glass of Two Oceans’ Shiraz or Pinot Noir to complement the dish. This tart has all the savoury goodness needed on a cold night. Serve the tart slices in bite sizes and you’ll have everyone chatting with ease without the worry about having a messy eat. On a floured surface, roll out the pastry to a thickness of a coin. Use the pastry to line a deep loose-based tart tin. Prick the base with a fork. Cover the pastry and allow to cool for 30 minutes in a fridge, or for 15 minutes in a freezer. Line the pastry with baking parchment. Then fill it with baking beans or dried rice. Place the tin on a baking sheet and bake for 15 to 20 minutes. Thereafter, remove the beans and parchment and return the tin to the oven to cook for another eight to ten minutes or until it has browned to a biscuit colour. Reduce the heat of the oven to 180 degrees Celsius. Meanwhile, prepare the filling: heat the oil in a large pan over a medium heat. Add onion, fennel and pepper to the pan and braise the ingredients for 15 minutes or until it has softened. Once the ingredients have begun to caramelise, add the garlic and cook for a few minutes more. Lightly, whisk the eggs, cream and milk together. Then add paprika and some seasoning. Add the vegetables into the shell of the tart and sprinkle some cheese and olives. Pour the egg mixture over the tart and then place it in the oven again. Bake the tart for just under 30 minutes or until it has golden and set. Remove the tart from the oven and allow to cool on a wire rack. Once cooled, remove the tart from the tin and cut into thin slices. 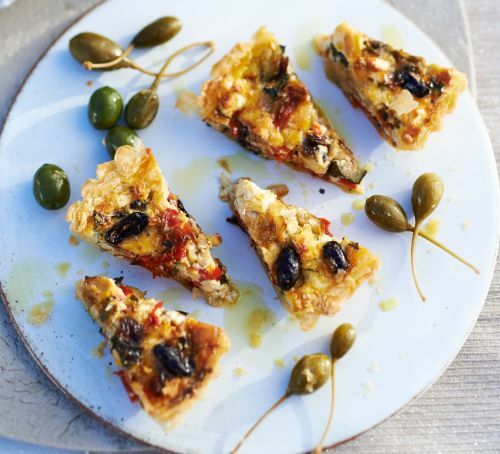 Serve these delicious tart slices with caper berries.